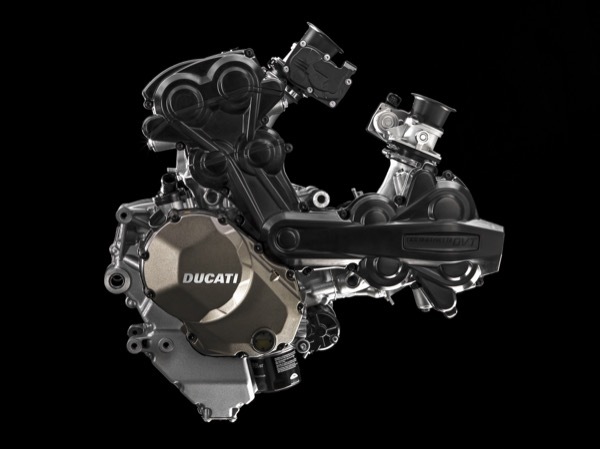 For 2015 Ducati has built a new Multistrada, changing the frame, the running gear and most importantly the engine to make it less angry, more flexible and even more powerful. 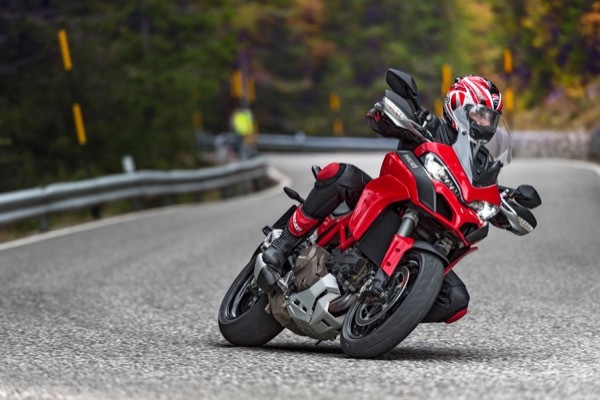 The Multistrada is Ducati’s most versatile bike, capable of carving up winding roads, taking on the urban grind, eating freeways and even blasting down gravel surfaces. 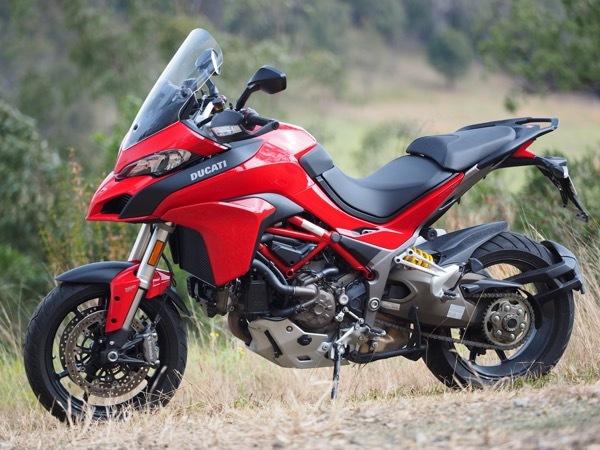 The nearest thing to an Adventure bike from a company famous for its road racing machines, the new Multistrada is particularly suited to Australia and our awful bitumen and endless dirt. Externally the bike hasn’t changed too much – it still looks much like the first Multistrada 1200 from five years ago. There’s an upright riding position which the Europeans call enduro, a protective half-fairing, tall seat and you can get it in a variety of colours, but we all know red goes fastest. Under all that bodywork though there have been lots of changes. The headline change is the DVT – Desmodromic Variable Timing. Designed to take away the angry, rough feel of the engine in the low and mid-range, the new system uses hydraulics to control the camshafts to alter valve overlap at different engine speeds, making the bike a lot smoother and more civilised without sacrificing top-end performance. Earlier Multistradas were cranky beasts. The engine felt rough, tough and cantankerous, which is fine in a high end sportsbike like a Panigale, but it’s not so pleasant on a machine aimed taking on the traffic. Most manufacturers get around these sorts of problems by reducing horsepower for more touring-oriented machines, but that’s a no-no for Ducati, which decided there must be a way to keep the performance by make the bike nicer to ride – so they invented DVT. Now, variable valve timing isn’t particularly new – Honda’s VFR800 has had variable valve timing for many years and it’s common in motor cars – but unlike the Honda Ducati got it right. Much smoother off the bottom and sweet in the midrange, the new DVT-equipped Multistrada is really fulfilling the promise it made but didn’t quite keep five years ago – there’s still the blistering 160hp top end, but now it’s civilised down low like a versatile bike should be. Unlike many systems the DVT works on both intake and exhaust valves and not only makes the power delivery more civilised, it also reduces fuel consumption. Engine updates also reach to the handlebars, with cruise control now standard – and so it should be. Any serious touring bike should have cruise control so I suppose better late than never, and Ducati’s done a good job here, with the easy-to-use switchgear mounted on the left handlebar. The cruise control is a part of the updated electronics, which now feature an Inertial Measurement Unit: now the bike’s computer knows knows the roll, pitch and yaw of the bike – so it can tell if you’re upright and giving it a handful to bring the front wheel up for a bit of one-wheel fun, or if you’ve got it cranked over and maybe full throttle isn’t the greatest idea. The IMU talks to the other fancy electronics – Ducati Traction Control, the ABS system and the other acronyms in an effort to ensure the dumbest part of the whole shebang – that’s the bit inside the helmet – stays happy. Ducati has changed the way it sells the Multistrada – there’s no longer a vast array of models, but just two, which you can then customise with kits for the type of riding you do – Sports, touring, urban or enduro. So the top of the range is the $27,990 1200S DVT – it has the same engine as the standard model but features semi-active electronic suspension, a full colour TFT instrument panel, bluetooth smartphone connectivity and bigger brakes than the much cheaper 1200 DVT we have here. This bike is the $23,990 standard 1200 DVT with the touring kit – panniers, heated grips and a centre stand. If you want luggage which is more city friendly, you can add the Urban Pack, which features a large top box and USB-charging equipped tank bag. For those smart enough to realise this Ducati is probably the fastest twin on a public road, there’s the Sport Pack with a Termignoni muffler, carbon guard and billet brake and clutch reservoir caps. The final pack is for enduro. Fog lights and Ducati Performance/Touratech engine protection bars, radiator guard, oil sump guard bigger side stand base and off-road footrests. All of the kits are $1787 except the Urban Pack, which is $1098. So no bike can really, truly meet the challenges of four types of riding can it? Seriously? Well, Ducati is pretty serious about the Multistrada’s capabilities across urban, touring, sport and enduro. The Multistrada is a superb touring bike. The riding position is really comfortable – there’s a bit more room than on earlier models, and the seat height is adjustable – and the fairing offers genuine protection from the wind, while the optional integrated luggage carries a decent amount. As a sports bike the Multistrada’s success up the switchbacks of Pikes Peak in the USA are testimony to its real-world sporting ability. There’s heaps of cornering clearance, horsepower and while it might get eclipsed in top speed by lighter, more slippery machinery and on the smoothest of surfaces by race track refugees, throw a few bumps in and the Multistrada rider will be going around all but the best of riders. Taking on the urban duties sees the Multistrada able to jump kerbs easily, get through gaps in the traffic as the ‘bars are higher than most cars’ mirrors and that great bottom end means she jumps from the lights to the front of the traffic flow with ease. As far as the enduro side goes, the Multistrada is surprisingly capable. I’m always nervous of 17-inch front wheels, loose surfaces and unseen potholes, so if you’re planning on doing mega distances on the gravel, maybe the Multistrada isn’t your best choice – however what the Multistrada does offer is the chance to take that tourist route with its stretch of dirt road, take the fire trail to the top of the ridge to shoot the sunset, ride the back road which happens to join two bits of twisty bitumen. 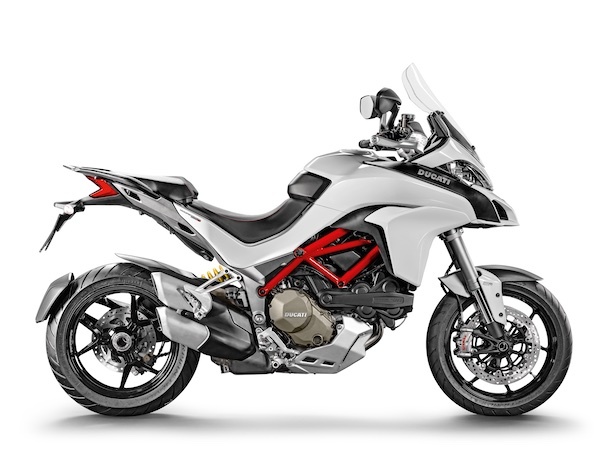 So maybe the Multistrada isn’t really four bikes in one – but it’s about as close as you can get in 2015. The DVT-equipped Multistrada is easily the best ever made. My criticisms of earlier models – lumpy engine, no cruise control, cramped riding position – have all been addressed with this version and there’s little left to criticise. Individuals might find the screen isn’t high enough to push the breeze over the helmet, there’s little lower-body weather protection, and the acres of plastic means it could be prone to damage if you try to get too adventurous, but really, I’m nit-picking. The DVT Multistrada is simply one of the most capable, most fun and most exciting bikes available today – or ever.